Bike-share in the Bay Area will now arrive no sooner than the summer of 2013, roughly a year and a half after the original launch date, according to the Bay Area Air Quality Management District. Alta Bicycle Share, the chosen vendor, is still negotiating a contract with agencies in the five cities in which the system is planned to launch, said BAAQMD spokesperson Ralph Borrmann. Once the contract is signed, he said, the launch will come at least six to eight months later. Few details are available on the causes of the repeated delays. 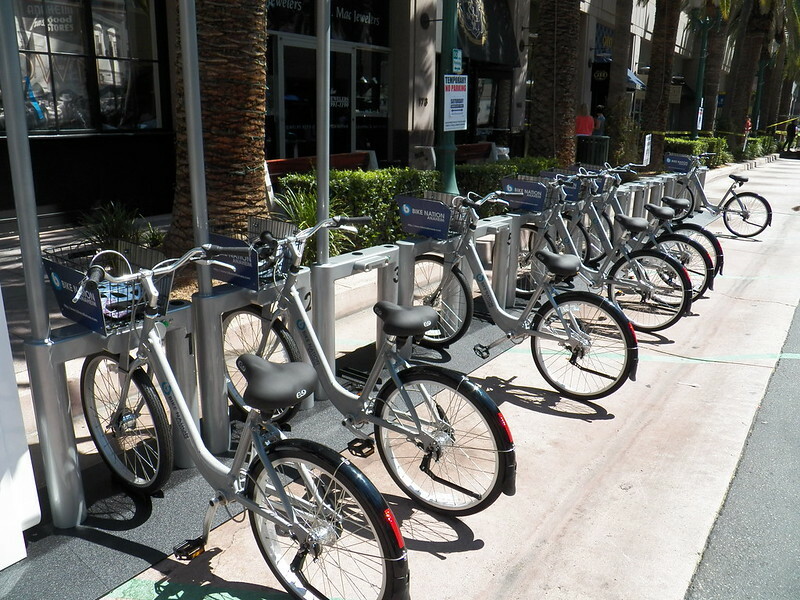 The BAAQMD offered the same explanation given in July, citing the complexity of launching the 1,000-bike system in multiple cities along the Peninsula. Alta has not responded to requests for more information. The multiple delays of bike-share — a program which SFMTA staff has called one of the most cost-effective ways to increase bike ridership — have kept San Franciscans waiting while bike-share systems thrive in peer cities like Washington, D.C., Boston, Minneapolis, and Denver. California’s first bike-share system launched this July in Anaheim, and is expected to expand in Long Beach and downtown Los Angeles in the coming months. Alta is the dominant bike-share vendor in major North American cities, and plans to launch other systems next year in New York City, Chicago, and Portland, where it is based. The New York launch — set to be the nation’s largest — has been delayed by software glitches, but it’s unclear if those issues have affected the launch of the Bay Area’s system. 1000 bikes spread among multiple cities is puny. This system will be a year and a half late and 9000 bicycles short. Exactly, 1k isn’t even enough for Northeast SF. Sadly, this is going to be a huge joke. Outrageous. Why make the perfect be the enemy of the good? Launch in SF first and expand to other cities later. Why does it have to be an all-or-nothing approach? 100% agree. This is setting ourselves up for failure, and then everyone can say: “See, bike share is a failed method of transit.” I’m truly surprised our government leaders aren’t smarter than this. They shouldn’t even be trying to roll it out through the whole Peninsula. Talk about biting off more than you can chew. Why don’t we just get a successful program up and running in SF and then talk about expanding it? The reason it is rolled in multiple cities because it is funded by different jurisdictions. It wouldn’t be reasonable to use those money to fund a SF only system, and if it isn’t planned as a single network, then you’ll get incompatible systems that would add inconvenience. As to the number of bikes, I expect that there would be a learning curve among the users and operators so it is a reasonable starting point. The bikes also supposed to have turnovers so if it is used at least by 4000 to 5000 users each day it is a good start. And also not everyone who rides a bike will use it because most will ride their own, particularly those who rely exclusively and aren’t combined with other modes (like transit, carpool, or SOV). I expect there would be very small diversion from people who ride their own bikes to riding on shared bikes. All Alta, all delayed multiple times. Shocking. use the opportunity to get it right. smart-dock is outdated. go to smart lock. http://inventropolis.com/?page_id=37 describes benefits of smart-lock technology. Is it being funded by different jurisdictions or just MTC? Pretty sure the evaluated a couple other systems before selecting Alta. if we really still have no contract, and the theoretical date is only moving, and Alta clearly is struggling everywhere, can we use this to take a re-look at our bike share vendor? LA is also delayed, and Anaheim had a month or two delay as well, and those two are Bike Nation.